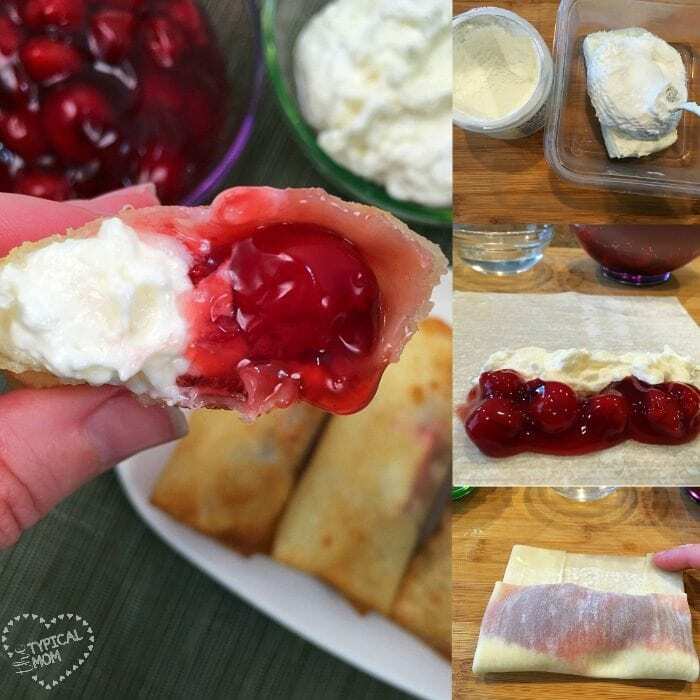 Cherry cheesecake egg rolls are amazing!! 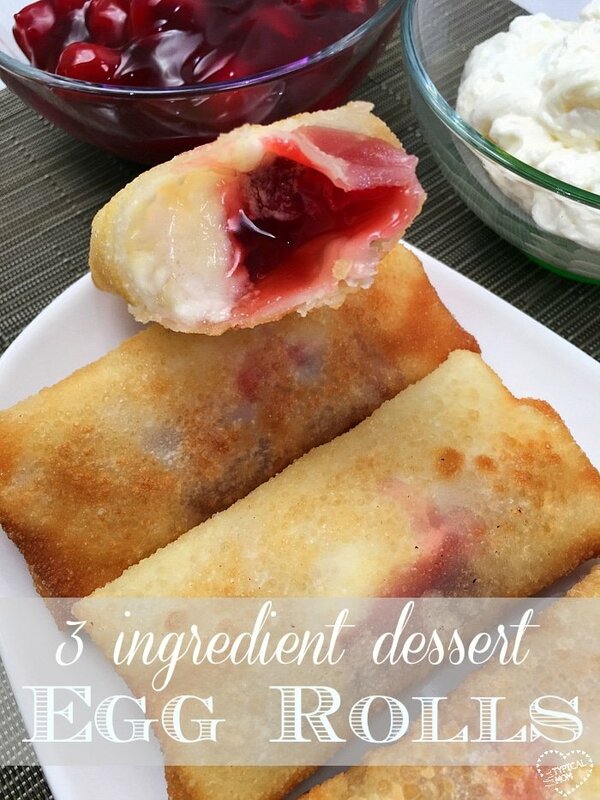 Just 3 ingredients in this warm dessert egg roll recipe. So easy and the easiest cheesecake recipe ever. I made pizza egg rolls the other day for dinner and they were so amazing that it was time for dessert!! I will show you below how to wrap that, beyond that you’re just frying them until crispy!! I have had people use their air fryer for these dessert egg rolls but I haven’t tried that myself quite yet. Get out a cutting board so you can put everything on it. Mix your room temperature pkg. 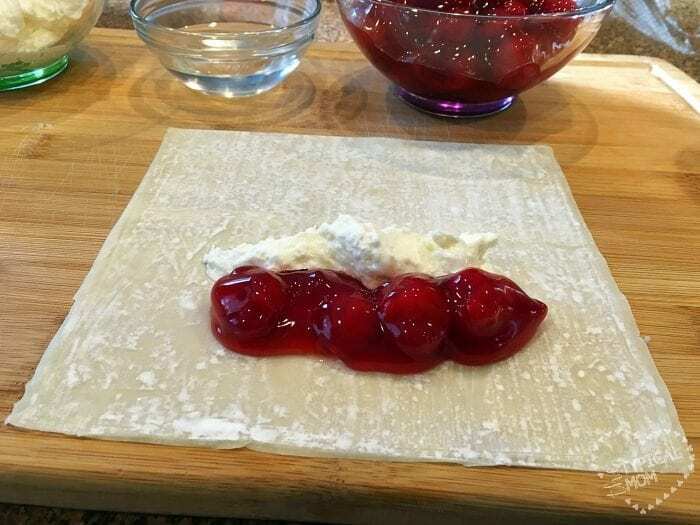 of cream cheese with your tub of marshmallow creme and put your cherry pie filling in a bowl so you can begin filling. You will need a small cup of water too. Here are the basic instructions on how to roll spring rolls which is essentially the same but I have step by step photos here as well as showing you in the video embedded in this post. It really isn’t hard once you do 1 or 2. 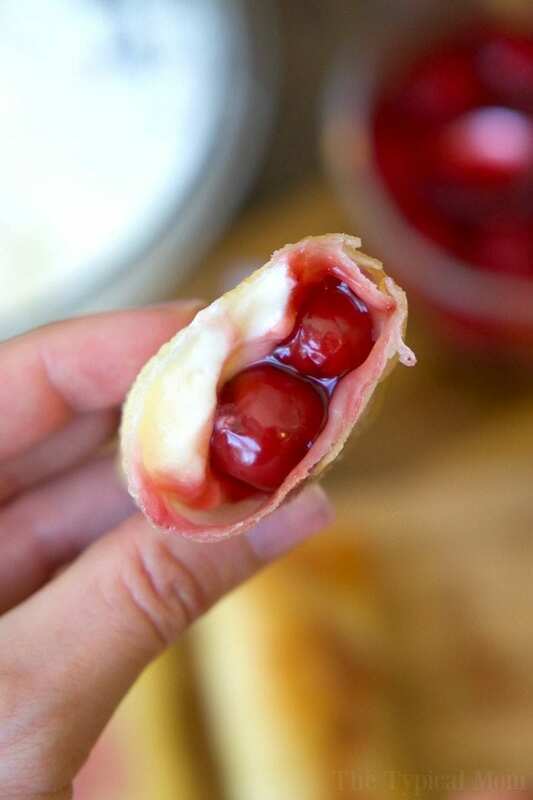 Put a bit of both fillings in like this on your egg roll wrapper. 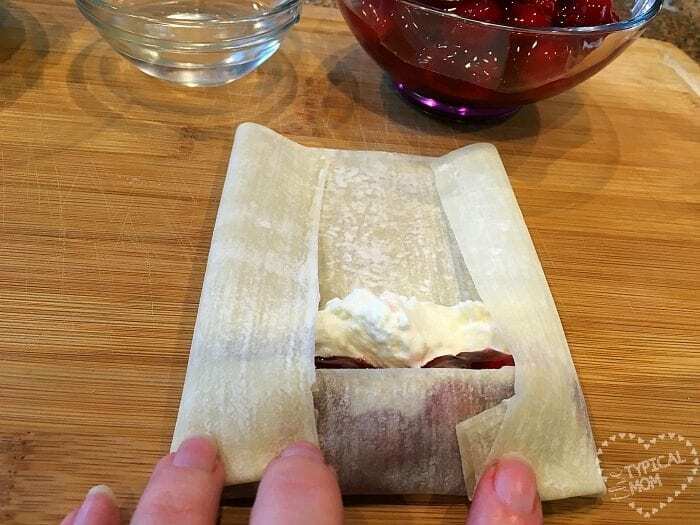 Then fold the end up and over and the sides in, then roll over once and put a bit of water at the end and roll it all the way over so the end sticks together and the filling won’t come out. You can also make our strawberry bread pudding but use cherry pie filling to taste similar to this! Make sure your oil is hot enough by dropping a little piece of egg roll in and see if it begins to fry but isn’t too hot. Then put each one in until they are lightly browned. 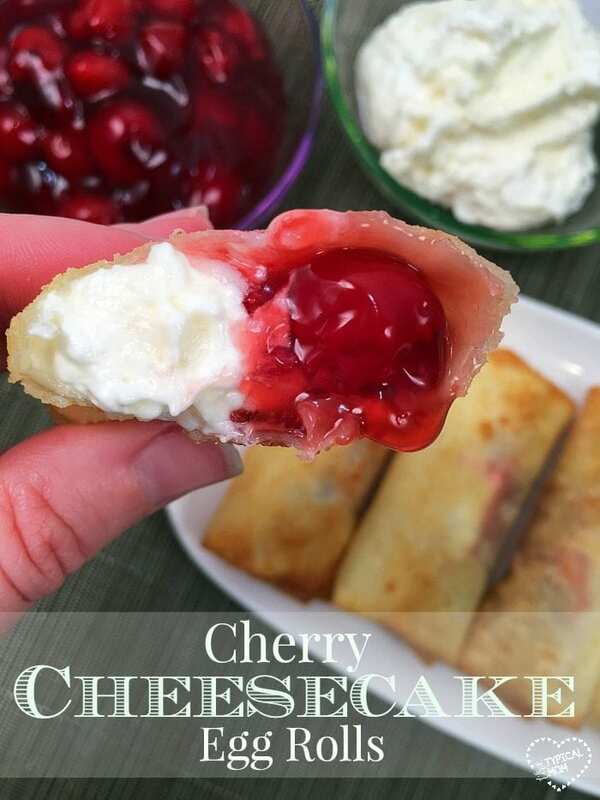 You can use the rest of the cheesecake filling as a dip on the side. 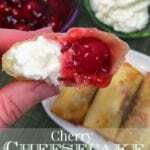 I’m telling you these cherry cheesecake egg rolls are an amazing dessert!! If you love these we made sloppy joe egg rolls too and they are really fun! Mix together your room temperature cream cheese and marshmallow fluff until creamy. Lay out 1 egg roll wrapper and add 2 tsp. cream cheese mixture as well as 2 tbsp. pie filling mixture. Roll egg wrapper like a burrito. Folding sides in and rolling from one end to the other with filling wrapped well inside. At end dab water across end of wrapper and fold over to create a "seal". Heat your oil. Test by putting a fingernail sized piece of egg roll wrapper into oil and if it begins to fry then oil is ready. Can you use Spring Roll paper instead of Egg Rolls for a GF option? Haven’t tried that yet but I imagine yes. Hi, How much is one tub of marshmallow fluff? They come in various sizes. How do you reheat if you make them 1day in advance.. The rolls looks so good! I’m planning on making these soon. What type oil are you using? Where is the directions using an air fryer? Sorry, I don’t own one of those to know how to use it. Can you use something to place the marshmallow fluff ? Or leave out .? You could just use the cream cheese and not add marshmallow, or leave out if you like. Typically enough filling for maybe 12 but depends on how stuffed you make them.